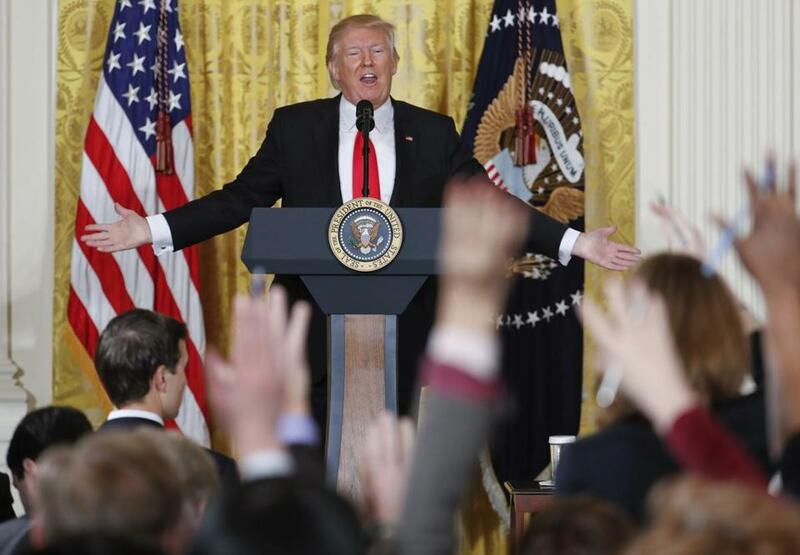 Reporters raised their hands during a news conference with President Trump Thursday. Majorities of Americans believe Trump “keeps his promises,” “is a strong and decisive leader,” and “can bring about the changes this country needs,” a new Gallup poll found. About two-thirds of Americans also said they believe world leaders “do not have much respect” for Trump, according to Gallup. Gallup noted that Trump’s job approval rating at the time of the poll, conducted between Feb. 1 and 5, was 42 percent. That was the lowest such rating this early in a presidency since 1945, when Gallup began tracking presidential job approval. The results, based on interviews with a random sample of 1,035 adults nationwide, also highlighted how Democrats and Republicans are worlds apart in their views of Trump. For example, 81 percent of Republicans and Republican-leaning independents said that Trump “is honest and trustworthy” compared with just 9 percent of Democrats and Democratic-leaning independents, the survey showed. Gallup reported that the number of Republicans who said they were satisfied with the way things are going in the United States was up sharply in a survey conducted this month compared to a survey last month, while the opposite was true among Democrats. This graphic shows the percentage of people polled who said each quality or characteristic applies to President Trump. This graphic shows the percentage of Democrats and Democratic leaners who said each quality or characteristic applies to President Trump vs. the percentage of Republicans and Republican leaners who did. SOURCE: Gallup interviews with a random sample of 1,035 adults nationwide conducted Feb. 1-5, 2017.